Morocco (Arab. Marakesh), a city and one of the capitals of the sultanate of Morocco, on the N. side of a plain 1,500 ft. above the sea, 4 m. S. of the river Tensift, and about 250 m. S. W. of Fez; lat. 31° 38' N, Ion. 7° 36' W.; pop. about 50,000. The walls, which are 7 m. in circuit, are built of tappia (earth, pebbles, and lime pounded together), and are about 23 ft. high. One part is flanked with towers at regular intervals, but most of them are in ruins, and the walls are so dilapidated that pedestrians easily find a passage in after the gates are closed. There are seven gates, besides two leading into the hasbali or citadel. A large part of the enclosed space is covered with gardens. The streets are wide at the gates, but in the centre of the city they form a network of filthy lanes, almost impassable for pedestrians in rainy weather. The houses are generally of one story, built of tappia whitewashed, with flat roofs and terraces, and opening on an inner court. They have no windows or doors to the street, the entrance usually opening on a lane connecting with the main street. The houses of the better classes have a second story of brick. There is no public promenade except the great square of the Jama el-Fna, where jugglers and mountebanks perform by day, and which is the rendezvous at night of the vagabonds of the city. A market for the sale of horned cattle is held in it every Friday. There are other markets and several bazaars for particular classes of goods. The iron merchants, blacksmiths, carpenters, and butchers have each their special street, which is shut at night, and in which no one is allowed to reside. Wholesale dealers have their offices in the caravansaries. The palace of the sultan, in the Tcasbah in the S. part of the city, consists of two grand courts, in the midst of gardens, around which are the royal residence and the chambers of the ministers and secretaries. N. of the palace and attached to it is the treasury, said to contain immense wealth. There are many mosques, some of which are very large, but none of any architectural pretensions. 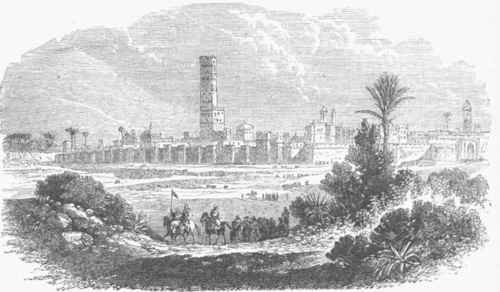 One having a tower 250 ft. high, surmounted by a lantern, is said to have been built by the architect of the Giralda at Seville. There are three prisons, one for Jews, one for general criminals, and one for prisoners of state. In the N. part of the city is the Zawia or sanctuary of Sidi ibn Abbas, a charitable institution, where the poor receive alms and an asylum for the night. It is also an inviolable refuge for criminals. Like most of the mosques, it is very rich, the houses and gardens belonging to it being valued at more than $1,000,000. Without the walls are several aqueducts, mostly ruinous, but which still bring water from the mountains into the reservoirs, and supply 20 public baths. The inhabitants of Morocco are a mixture of Moors, Algerines, Tunisians, Egyptians, Arabs from the Sahara, negroes, and Jews. The latter, who number about 6,000, have a quarter of their own, called El-Melah. They seldom go into the city proper, and when they do both men and women are obliged to take off their shoes. A large part of the business is in their hands, and they are the gold, silver, copper, and tin smiths of the city. Morocco is an agricultural rather than an industrial centre. The sole manufacture in which it excels is that of leather, particularly of red and yellow morocco. All products of the country, excepting the cereals, pay an octroi duty both going in and going out of the gates. There is also a tax of 2 1/2 per cent, on all sales, paid by the buyer, and the government has a monopoly of tobacco. - Morocco was founded in 1072 by Abubekr ben Omar, of the dynasty of the Almoravides. It was captured and nearly destroyed in 1146 by Abdelmumen, king of the Almohades, who rebuilt and restored it in 1147-'8. Schools and colleges were founded by his successors, and in the 13th century it was a famous seat of learning, and the Moors of Spain, Algeria, and Tunis sent their children to be educated in its universities. At the height of its prosperity it is said to have had a population of more than 500,000. Its decadence began with the expulsion of the Moors from Spain.